People watching, program bashing… I’m better than you. I got started with weight training in high school. 18 years ago. I started with the Bigger, Faster, Stronger program. I got stronger (obviously). Then I got involved with powerlifting. Squat, bench, deadlift. Max effort. Dynamic effort. I became so engrossed in the sport that everything I saw in the gym was “dumb.” Benching on a smith machine? Dumb. Close stance squatting? Dumb. Doing curls as your first exercise? Dumb. And what’s even dumber than that?? Half range bench presses, quarter squats and clearly less than full range of motion leg presses. Come on… admit it. You’ve muttered “that’s dumb” more than once while watching out of the corner of your eye (and maybe even catching a video on your phone). Even though I had trained bodybuilding style back in my college years, I never competed and never really focused on exactly what I was doing and where it was taking me. I had no specific goal. So when I did my figure and physique shows this past year, it all hit me right square in my face. Partial reps? Shortened range of motion? Using a weight that looks like it’s clearly too heavy but “cheating” out a few extra reps? Yep, I’ve become one of them. One of those “weirdos” in the gym that I snickered at. So what was the difference? But you know what, I didn’t care. I knew my program and I knew why. Lately, I’ve been seeing quite a few people rant about massive leg presses. But… before we judge, perhaps we just don’t know their program. Maybe there’s a reason. You know what… who cares. Could he get bigger/stronger/faster/more athletic if he was squatting?? Perhaps. What really are the chances of him knowing what he’s doing? I think science shows there a 92.7% chance that he doesn’t know. But you know what… we still don’t know. Being in this strength game for 18 years, the more I broaden my view, the more I learn. I have found that things that seemed specific to powerlifting might have a carryover to sports performance. 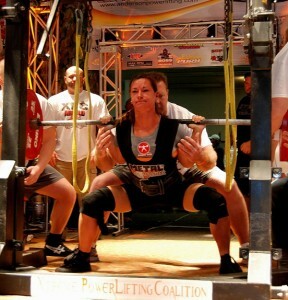 And things that might seem specific to bodybuilding might have a carryover to powerlifting. Keep learning. Learn from others stronger than you. Learn from those in other strength sports. Read, experiment and keep your mind open. Nice post Julia. I know I’ve done that in the gym but I’ve come to the conclusion that so long as people are not going to hurt themselves, it’s great that they are moving. I’ve seen people doing stuff in the gym that has resulted in injuries, such as heavy barbell lunges for the guy who couldn’t do a bodyweight lunge. I myself am guilty of watching others in the gym (pure gymrat so I’m in there a lot to see), and thinking “what are you doing?”, or “come on you can push yourself more!”, and I truly believe that a lot of time they can, but then I stop and THINK MORE. There is more than one way to train, and more than one way to get results so let them be. I love to explore different ways to get the most out of myself and my workouts and just because someone else’s way is different than mine it doesn’t make it wrong…just different. The more that I LEARN and EXPLORE what I like and what my body responds to, the more I realize someone else can have that same thought with a different approach. So I keep this in mind when training and seeing others train at the gym, on the track, or on the court…am I/are they…training hard, having fun and taking one rep/step closer to where I or they want to be? I so then all is well! Thanks again for the awesome read!